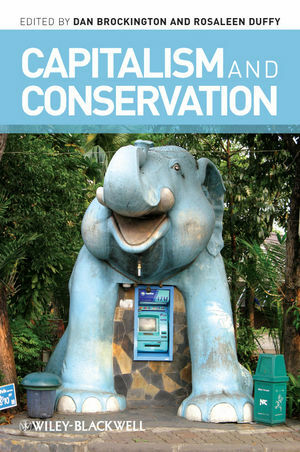 Through a series of case studies from around the world, Capitalism and Conservation presents a critique of conservation’s role as a central driver of global capitalism. Dan Brockington is a Senior Lecturer in the School of Environment and Development at the University of Manchester. He is the author of Fortress Conservation (2002), Celebrity and the Environment. Fame, Wealth and Power in Conservation (2009) and, with Rosaleen Duffy and Jim Igoe, Nature Unbound: Conservation, Capitalism and the Future of Protected Areas (2008). Rosaleen Duffy is Professor of International Politics at Manchester University. She is author or co-author of several books, including Killing for Conservation (2000), A Trip Too Far: Politics, Ecotourism and Exploitation (2002), and Nature Crime: How We’re Getting Conservation Wrong (forthcoming, 2010).